The creation of Taqueria Yarelis in the central California city of Fresno, the “Anaconda” is the Millennium Falcon of carne asada burritos. 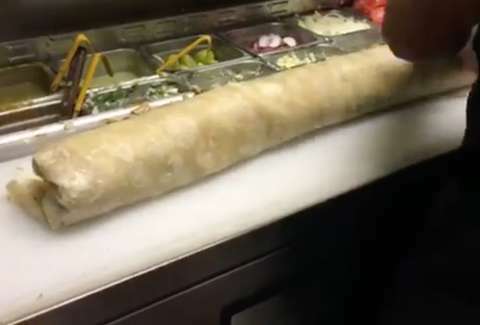 It is a glorious monstrosity, and has taken the internet by storm since the restaurant posted a video on Facebook, showcasing the beef-torpedo in all of its sweaty majesty. The video has anyone with an appetite and a predilection for meat in a tizzy, as it’s garnered over 17.5 million views. In it, Edwin Espinoza is an unassuming burrito-sorcerer, deftly loading up five tortillas with beans, cheese, onions, carne asada, two kinds of salsa, sour cream, onions and guacamole. What he creates is a marvel of burrito-engineering, a wonder of the culinary universe larger than your baby cousin. Espinoza told The Fresno Bee that the restaurant has never been subject to such burrito hysteria, fielding over 1,000 orders for the Anaconda in three days. In fact, the humble family business has been completely sold out of carne asada on two separate occasions since the video went live. According to Espinoza, that’s 200 pounds of carne asada -- the equivalent of a cruiserweight boxer in seared beef. If you’re up for a burrito pilgrimage, flock to the fair town of Fresno. The Anaconda is $23, but the expense is really just a pittance, as you can probably keep the burrito in your fridge for a week. Sam Blum is from Los Angeles and probably has better taste in burritos than you do. He understands he's annoying. Follow him @Blumnessmonster.